Fallout Shelter is a free-to-play mobile simulation video game developed by Bethesda Game Studios, with assistance by Behaviour Interactive, and published by Bethesda Softworks. Part of the Fallout series, it was released for iOS devices on June 14, 2015, and for Android devices on August 13, 2015. Fallout Shelter tasks the player with building and managing their own Vault - a form of fallout shelter. To run a successful vault, they must rescue stragglers from the outside wasteland and have them level up to create resources, defend the vault, and scout the outside. Players must balance their resources and quell disasters in order to create a stable living environment. Fallout Shelter was released to mostly positive reviews. Critics enjoyed the game's extension of the Fallout universe and it's lack of reliance on microtransactions. Common complaints included the game's clunky controls, its low-resolution visuals on certain devices, and its lack of an ending. Ant farm view. Vault resources are shown along the top of the screen. A notification appears when a room produces resources. In Fallout Shelter, players build and manage their own Vault as an overseer - the leader and coordinator of their vault. Players guide and direct of the citizens of the Vault, and need to keep them happy through meeting needs such as power, food, and water. They rescue dwellers from the wasteland and assign them to different resource-generating buildings in the vault, using the SPECIAL statistics system from the other Fallout games. Each character's SPECIAL profile affects their ability to generate different resources, and their statistics can be increased by training them in rooms devoted to each stat. The dwellers can level up over time, increasing their health, and can be given new items and weapons to help with various tasks. The number of dwellers can be increased by waiting for new dwellers from the wasteland to arrive, or by pairing a male and a female dweller in living quarters to produce babies. Balancing resources such as food, water, and power is an important aspect of the game. Many different rooms can be built in the vault, providing different items or stat bonuses. Players are not required to spend money in order to accelerate long timers or processes, instead having the option to instantly complete tasks at the risk of catastrophic failures - such as fires or "radroach" infestations. Players are sometimes rewarded with lunchboxes that contain rewards, such as items or resources, which can purchased separately through microtransactions. In a 2009 interview with Engadget, while talking about a possible Fallout game for iOS, Bethesda's Todd Howard said that the world of Fallout was "unique enough that it could translate to any platform", revealing that several designs of an iOS Fallout game were pitched and rejected. On November 5, 2009 John Carmack, who at that time worked for id Software, said that while it's nothing official yet, he had an internal proof of concept made for a Fallout iPhone game. Carmack said that he will likely be personally involved in making the game, although at the time he was working on other projects. He added that "at the very least I'm going to be providing code." Fallout Shelter was announced by Bethesda during its press conference at the Electronic Entertainment Expo on June 14, 2015, where it was confirmed the game is a free-to-play title that would be released for iOS the same day. It was developed in a partnership with Behaviour Interactive, and was built using the Unity game engine. The game was also released for Android devices on August 13, 2015. According to Pete Hines, vice president of Bethesda, the game is inspired by other video games like Little Computer People, Progress Quest, XCOM, SimCity, and FTL: Faster Than Light. On June 30, 2015, the game added a character from Fallout 4 as a dweller for the first time. Preston Garvey, the leader of Commonwealth Minutemen, was added as a reward available from lunchboxes, along with his Laser Musket weapon, which can be equipped by other vault dwellers. On July 10, 2015, the game received its first update which fixed some issues while adding a new "Photo Mode" feature that allows players to capture and share images of their Vault. On August 13, a major update was launched alongside the release of the Android version, adding mole rats and deathclaws as new enemies. It also added a new feature where raiders would now begin to steal caps, instead of only stealing resources as before, and a robot butler named "Mister Handy" only available through lunchboxes. Fallout Shelter received mixed to positive reviews on release, with an aggregate score of 72.04% on GameRankings based on 25 reviews and a score of 71 out of 100 on Metacritic based on 39 reviews. Reviewers generally enjoyed the gameplay, though criticizing it's lack of depth. Harry Slater from Pocket Gamer stated, "It's not exactly the most exciting post-apocalyptic game out there, but if casual is your bag there's a lot to like here." Chris Carter from Destructoid wrote, "I don't want to play it every day forever and ever, but it's definitely worth the time I invested in it." Justin Davis of IGN remarked "Fallout Shelter is desperately in need of a set of endgame goals or resource sinks to look forward to." The visuals also gained some praise. Daniel Tack of Game Informer summarised the visuals as "flavorful in the iconic Vault Boy aesthetic." Chris Carter remarked that "visually, Fallout Shelter is far more impressive than most resource-management games on the market". Jason Faulkner of Gamezebo found the graphics "impressive", writing "not only are the cute little vault dwellers presented in sharp, Fallout-faithful style, but the vault itself is quite stunning." Reviewers had mixed opinions about the game's inclusion of microtransactions. Jeb Haught of Game Revolution opined, "when I add the micro-transaction advantage to the post apocalyptic mix, the result puts a sour taste in my mouth". Daniel Tack claimed that "the cash shop option in this free-to-play game is completely unobtrusive and unnecessary". In contrast, Justin Davis says that "virtually every other gameplay element must be earned the old-fashioned mobile way - by just waiting around." Fallout Shelter became the most popular iOS application in the US and UK within a day of it's release, and the most popular iOS game on June 26, 2015. On the day of it's release, Fallout Shelter became the third-highest grossing game in the iOS App Store, earning more than 2 million dollars per day. By July 16, 2015, the game earned 5.1 million dollars in microtransaction sales - just two weeks after release. ^ a b c Hilliard, Kyle (June 14, 2015). "Fallout Shelter-Management Mobile Game Out Now On iOS". ^ a b c d e Yin-Poole, Wesley (June 15, 2015). "Surprise! Fallout Shelter iOS game out now". ^ a b Dotson, Carter (June 15, 2015). Fallout: Shelter' Hands-on impressions: Tiny Vault"'". Touch Arcade. Retrieved June 15, 2015. ^ Koziara, Andrew (June 18, 2015). Fallout Shelter' Guide – Strategies, Tips and Tricks for the Industrious Post-Apocalypse Vault Overseer"'". Touch Arcade. Retrieved June 18, 2015. Vice Versa, people in training rooms only increase stats, and don't level up. ^ a b c d Samuel, Ebenezer (June 16, 2015). "Fallout Shelter is grounded in fun: video game review". ^ Byford, Sam (June 15, 2015). "Watch the first 10 minutes of Fallout Shelter here". ^ Karmali, Luke (June 14, 2015). "E3 2015: Fallout mobile game Fallout Shelter available now". ^ Duwell, Ron (June 14, 2015). "Fallout Shelter lets you create your own fallout vault, available tonight". TechnoBuffalo. Retrieved June 15, 2015. ^ McElroy, Justin (June 5, 2009). "Bethesda has designed iPhone versions of Fallout 3". ^ Crecente, Brian (November 5, 2009). "Carmack on iPhone Fallout, Quake Live and Elves and Orcs". ^ Takahashi, Dean (July 17, 2015). "The DeanBeat: Fallout Shelter is a rare free-to-play mobile gaming hit". GamesBeat. ^ Dale, Laura Kate (July 6, 2015). "Unity - does indie gaming's biggest engine have an image problem?". 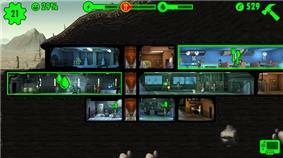 ^ "Fallout Shelter now available on Android". ^ Plunkett, Luke (June 14, 2015). "Fallout Shelter announced, out tonight". ^ Starr, Michelle (June 14, 2015). "Surprise! Fallout mobile game arrives for iOS". ^ Pereira, Chris (June 30, 2015). "First Fallout 4 Character Comes to Fallout Shelter Today". ^ O'Brien, Lucy (June 30, 2015). "Fallout Shelter adds its first Fallout 4 character". ^ Sirani, Jordan (July 10, 2015). "First Fallout Shelter Update Adds Photo Mode". ^ Grant, Christopher (August 13, 2015). "Fallout Shelter is now available for Android, update available for iOS". ^ Gurwin, Gabe (August 13, 2015). "Fallout Shelter gets a huge update, hits Android". ^ a b "Fallout Shelter reviews on GameRankings". ^ a b "Fallout Shelter reviews on Metacritic". ^ a b c Carter, Chris (June 15, 2015). "Fallout Shelter review on Destructoid". ^ a b c Tack, Daniel (July 1, 2015). "Fallout Shelter review on Game Informer". ^ a b JebHaught (July 1, 2015). "Fallout Shelter review on Game Revolution". ^ "Fallout Shelter review on GamesTM". ^ a b c Davis, Justin (June 26, 2015). "Fallout Shelter review on IGN". ^ Sapieha, Chad (June 16, 2015). "Fallout Shelter review: Bethesda’s survival sim is fun, but doesn’t escape free-to-play mechanics as much as they claim". ^ a b Faulkner, Jason (June 18, 2015). "Fallout Shelter Review: The Cutest Apocalypse". ^ a b Slater, Harry (June 15, 2015). "Fallout Shelter - Probably not the one you wanted". ^ Killham, Evan (June 15, 2015). "Fallout Shelter makes living in a postapocalyptic bunker adorable and totally free". GamesBeat. ^ a b Fields, Sarah. "‘Fallout Shelter’ is Beating ‘Candy Crush Saga’ in Profits & iOS App Store Rank". Game Rant. Game Rant, LLC. Retrieved November 1, 2015. ^ White, William (June 26, 2015). "Fallout Shelter: The New Most Popular Game in App Store". InvestorPlace. InvestorPlace Media, LLC. Retrieved November 1, 2015. ^ Prell, Sam (July 16, 2015). "Fallout Shelter rakes in $5.1 mil in two weeks - that's a lot of bottlecaps". GamesRadar+. Future US. Retrieved November 2, 2015.